Do you know where your family is going? Where you are headed? Are you making daily decisions that will help you reach your destination? If you’ve been feeling like you might be drifting, consider creating a family mission statement. Before you take a trip, you first decide where you’re going. And then you make all the necessary plans for how you’ll get there. The most successful trips are the ones that are carefully planned. In the same way, we can’t just allow ourselves to drift through life and hope we’ll eventually end up somewhere awesome. A family mission statement is the road map to help your family get where you want to be. 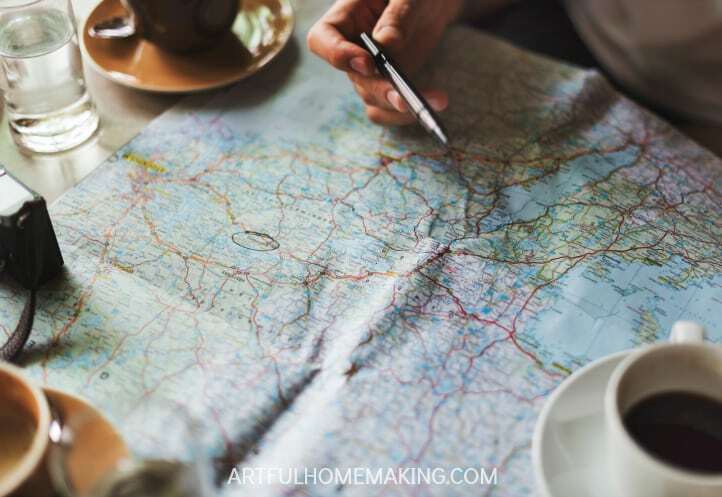 If crafted carefully, it will keep you from drifting and enable you to make intentional choices about how you spend your time and money, and what your family will focus on. It also has the added benefit of giving your family a shared vision and helps get everyone going the same direction. First, you need to envision who/where you want to be. You can’t create what you haven’t first visualized. Plan a family meeting specifically for the purpose of planning and drafting your family mission statement. Make it fun! Have a special treat waiting when you’re done. If your children are younger, this will probably just be a meeting between you and your spouse. If you have older children, it’s a great idea to include them in this meeting. They’ll more readily own it if they’ve helped create it! During your planning meeting, consider the unique strengths and giftings of each family member. What has God called our family to accomplish? What is the purpose of our home? Where do we hope to be in 10 years? How do we want others to remember our family? Write down your answers and then use them to help you determine your focus and goals. You may need to do some editing and refining before you feel happy with it. And don’t rush! This is something you’ll want to live with, so take your time to make it something meaningful. Don’t get too hung up on perfect, though! It won’t be perfect. And you can always come back and revise it later. Once you have your mission statement down on paper, you’ll need to review it regularly in order for it to make an impact and be a catalyst for growth and change. 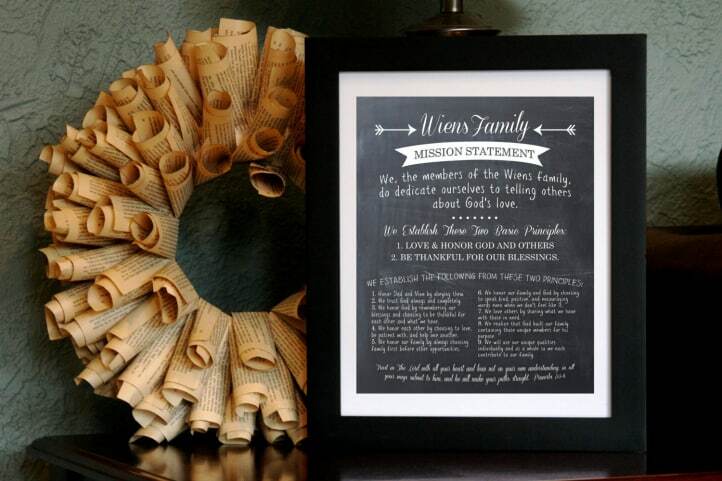 Some families even frame their mission statement and hang it in a prominent place where it can be easily and frequently reviewed. 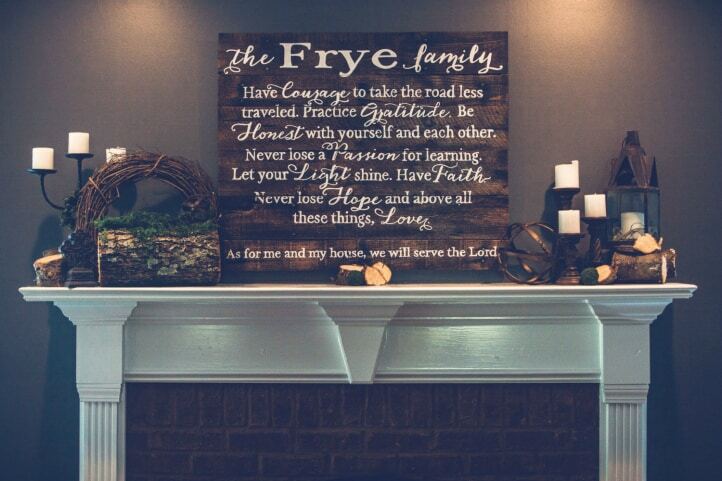 This personalized wood sign turns your family mission statement into a piece of heirloom art. I would love to have this hanging in my home! Memorizing it would also be a great idea. This way it will more easily be remembered and referred to on a regular basis. If your mission statement is long, you might want to come up with a motto that sums up your statement, and then you can just memorize the family motto. Your mission statement will most likely need to be updated and revised as the years go by. This is to be expected, as our lives and our families change. My husband and I created our first family mission statement years ago, when our children were younger. We’ve revised it and changed it many times through the years. Build time into your calendar (at least once or twice a year) to periodically go over your statement and make changes as necessary. The important thing is that you don’t just create the mission statement and then forget about it. Use it! 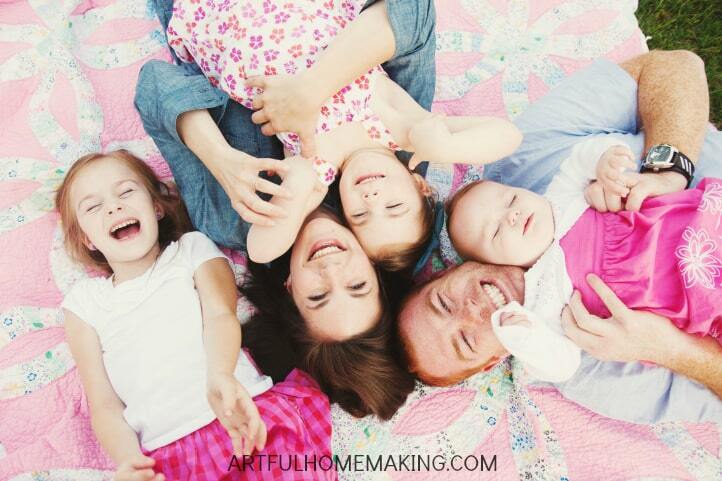 And as you do, you’ll be on your way to building a more intentional, purposeful family life. 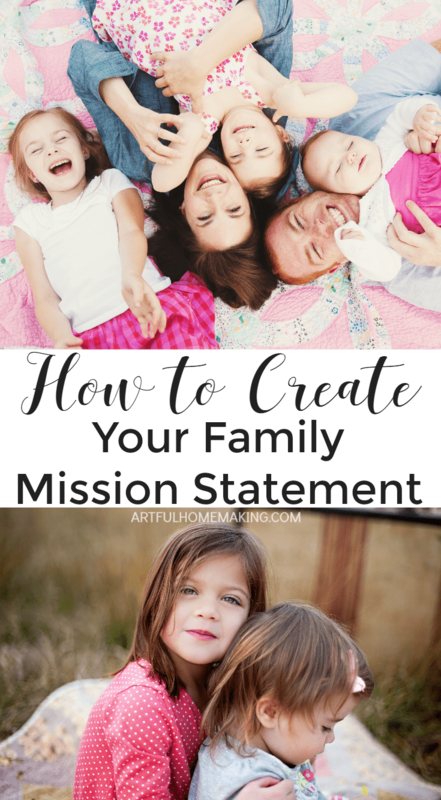 Do you have a family mission statement? Disclosure: This post includes affiliate links. Read my full disclosure here. Sharing this post here. This is a great post! I love the idea of a family mission statement. We are always setting goals to reflect the ever changing needs of our family. This is such a helpful post Joy! It’s something I’m working on with my family in this new year. Thank you. You did write this post on the right moment for me and my family! I’m so glad, Carolien! Blessings!